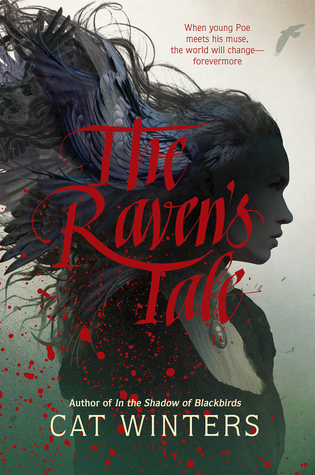 To ask other readers questions about The Raven's Tale, please sign up. Is there romance in this? Wow, I think Cat Winters did a great job on this book! I was reading through her author's notes, etc and she was telling how she went about finding out as much history as she could before writing this book. I think she made a remarkable book on fiction and fact to create a young Poe. I loved reading about Lenore! The book is written in two POV's; Edgar and Lenore. I must say it's bloody brilliant. I loved the creepiness to the book and the way the author incorporated a muse for different people. It was so freaking gothic and awesome and like I said a bit creepy. If you accept what you have created then the creepiness goes away and you find that you have a friend for life. That's all I'm going to say before I sit right here and type a spoiler before the book is even out yet. This is February and this fine book will be out in April; I'm putting it on my birthday book buying list for myself. Edgar, Edgar, Edgar—what a magnificent writer he was. So when I heard there was going to be this book on a young Edgar Allan Poe, I was so incredibly interested! Lenore, Lenore, Lenore! I want to read about you anywhere forevermore! Let me tell you something, my dear friends, I loved Edgar and his struggles and his sensitivities in this book. This boy definitely needed a muse to help him escape his terrible adopted father and all the things that occurred because of him! And Lenore? She was such a Edgar, Edgar, Edgar—what a magnificent writer he was. So when I heard there was going to be this book on a young Edgar Allan Poe, I was so incredibly interested! Lenore, Lenore, Lenore! I want to read about you anywhere forevermore! Let me tell you something, my dear friends, I loved Edgar and his struggles and his sensitivities in this book. This boy definitely needed a muse to help him escape his terrible adopted father and all the things that occurred because of him! And Lenore? She was such a lovely and horrific creature who was the perfect muse to draw out the tales that one day become famous. I can't tell if I hate this or am just not in the mood for it, either option being depressing as hell because EAP was my original literary love and I was so pumped for this. I'll pick it back up soon and try again. destiny ♡⚔♡ [howling libraries] megs_bookrack wrote: "Sorry you weren't enjoying this, Destiny! The cover is great but something about the synopsis even...I just can't add it to my T megs_bookrack wrote: "Sorry you weren't enjoying this, Destiny! The cover is great but something about the synopsis even...I just can't add it to my TBR..."
I'm sorry. I tried. I really tried. I love Winters' writing but I just cannot care about this. I guess I just don't find the life of Edgar Allan Poe anywhere near as interesting as I thought I would. An atmospheric and inventive nod to one of literature's most memorable writers. In portraying a young Edgar Allen Poe, Winters has clearly done considerable research to achieve a sense of authenticity, and her idea to characterize Poe's muse as a "raven-haired maiden in a gown spun from threads made of cinders and soot"* is marvelous. Chapters alternate between Edgar and his muse, Lenore, which lends itself to an unfortunate amount of repetition. The stakes are low and, by the midpoint, the narr An atmospheric and inventive nod to one of literature's most memorable writers. In portraying a young Edgar Allen Poe, Winters has clearly done considerable research to achieve a sense of authenticity, and her idea to characterize Poe's muse as a "raven-haired maiden in a gown spun from threads made of cinders and soot"* is marvelous. Chapters alternate between Edgar and his muse, Lenore, which lends itself to an unfortunate amount of repetition. The stakes are low and, by the midpoint, the narrative starts to feel stagnant. However, readers who push to the final page are rewarded with a chilling poem crafted by Winters in the style of Edgar Allen Poe. "What are you?" he asks once again, and he gulps with a grimace, as though swallowing swill. "Why do you look so cadaverous . . . and . . . so raven - ous?" I adore Poe, and really admire how much research Ms. Winters put into this tribute to his teen years. The story almost has a "magical realism" feel to it over straight up fantasy, which gives events a very surreal and dreamlike quality at times. Also, the nods to Poe's prose and poetry throughout are beautiful! This is written in such a way as to leave me wondering if the ghost of Poe came to this author as her Muse for this book. "Good morning, ladies and gentlemen!" I imagine myself saying from the pulpit in the pink sanctuary of our church. "My name is Edgar Poe, and today, for reasons I don't fully comprehend, I'm obsessed with with the seventy-two bodies buried beneath us." Oh, what a tale! While I am not obsessed with Poe's works to the point I can quote them from any angle, have mused upon the d This is written in such a way as to leave me wondering if the ghost of Poe came to this author as her Muse for this book. Oh, what a tale! While I am not obsessed with Poe's works to the point I can quote them from any angle, have mused upon the differing tempos, or sat in brooding thought regarding his stories . . . I do really love the writing of Edgar Allan Poe. 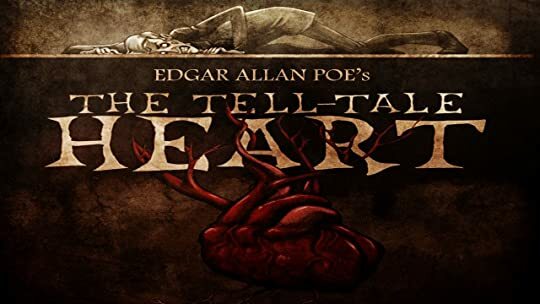 I feel like those weird, dark poems and stories GET me, which of course is something strange to say if the first Poe thing you think of is The Tell-Tale Heart. This literally reads like something pulled from Poe's mind. Cat Winters strikes again with her literary talent, reminding me yet again why I love her books so much. Every single sentence feels like the author spent hours crafting it into mad perfection. The amount of research she puts into her books truly shows because every time I am pulled into history and I never want to leave. But, this wasn't just historical fiction. This is a book about Poe who dreamed in dark fairytales and lost loves and beating hearts. There is magic in this story in the form of Lenore, Poe's dark muse. Now did my brain automatically go "ship them"?? Yes, of course it it did. There is just so much conflicted tension between these two artists--one of flesh and blood, the other of dreams and feathers--that I couldn't help myself!! Yet while this book is about the magical bond between Poe and his muse, an interesting take on where this famous poet got the inspiration for his well-known works . . . it is also about the growth of a young man chained by social expectations into a man who becomes who he wants to be. There is a lot of thematic elements about this, so don't just come expecting a dark and magical tale--like Poe's works, there is great depth to the surface horror and melancholy. And that's what really sold me on this, what really made me believe it was if the muse of Poe himself came to the author and helped her write this story. Got an ARC!! One of my most anticipated! 😍 Can’t wait to start it! Lately, I’ve stopped writing reviews for books that I DNF, but since I received an ARC of this in exchange for one, I figured a brief summary of why this didn’t work for me was necessary. You should know that I adore Cat Winters. This is the first book by her that I haven’t flat-out loved. I will still one-click buy literally everything she writes, so take this review with a grain of salt. Usually, I find her prose so enthralling that I tend to inhale her works in a single sitting. This one was a struggle to get through. And Winters for me has always had this haunting, poetic way of writing that stays with me long after I finish reading. For a book about a haunted poet, the writing here wasn’t up to her usual scratch. This book read like it once had a lot of info dumps that were heavily edited out and instead shoved into dialogues and inner monologues in a way that felt forced. In the forward, Winters mentioned how much research she did for this. It shows. Not in a good way. Usually I find her world-building to be effortless and organic. This felt stilted and forced in comparison. This also lacked her usual elegant prose. Instead, this story suffered beneath the mimicry of a century-old writing style. So, brilliant concept, but the execution fell short for me. In Cat Winters re-imagining of the life of Edgar Poe, he isn't the master of the Gothic that we know him as in the present-day. Edgar Poe is the seventeen-year-old son of a family that would see him forego his creative outlets for a respectable job in his foster-father's business. But Edgar Poe already feels the pull inside of him. The allure of the morbid and macabre is strong, and whilst he is immersed in the act of immortalising the dead with his words, he wills his muse into existence. Lenore is a thing of dark beauty. She is moonless midnights and hidden coves in forgotten cemetries. She combines the fear of a ghostly apparition with the repulsion of the open grave. She wills dark energies into existence and consecrates the wilfully overlooked. Lenore is Edgar's muse and if he does not create then she will suffocate. Edgar Allan Poe is a well-known and deeply-revered name today, but this fictionalised version of his upbringing casts his figure in an alternative light. Here, Edgar is just a boy learning to hone his craft and understand the world around him. This is largely focused on the coming-of-age of a boy who wills himself respectably average even as he finds himself unable to resist the allure of the dark recesses of his mind. I adore how many of Poe's original words made their way into this retelling of his life. The reader gets to understand the basis for his satires, the lexical struggles for rhymes that evaded him, and the drawn-out events that are compounded into verse. We witness the many prior versions that existed of his poetry before the final product that sees his name as immortalised as the long-dead he seeks to do the same for, with his words. Dannii Elle David - proud Gleeman in Branwen's adventuring party wrote: "What a beautifully written review, Dannii! :)"
Twisted, dark, and filled with all the things I remember from my Poe days, I loved both With a dark almost macabre feel, The Raven's Tale is classic Poe without being classic Poe. Thanks to Netgalley and Amulet Books/ ABRAMS Kids for a digital galley in exchange for an honest review. All opinions expressed are my own. My first and only encounter with Cat Winters was in the YA anthology Slasher Girls and Monster Boys. In her most recent work, Winters introduces us to a teenage Edgar Allen Poe and his supernatural muse, Lenore. Although I have never shied away from the poet and his works, I cannot say I am an ardent fan. On the other hand, Cat Winters is definitely in the Poe fan club and her extensive research shines as she shows Poe's internal struggles with his Gothic style by giving him a Gothic storyline. While I felt "Eddy" was a bit hard to take for the majority of the novel, I was truly captivated by Lenore. It is her narrative voice that still haunts me and truly shows the writing depth of Cat Winters. Because the writing is the true gem of this tale. Every sentence is so vivid in detail that I could see the whole story before me like a painting. I am glad that I gave Cat Winters my attention and now I am curious as to which of her previous works I should check out. Feel free to leave your recommendations in the comment section below. You can find the full review and all the fancy and/or randomness that accompanies it at It Starts at Midnight . I have never been so sad to not love a book. Like ever. And usually, when it's a book by an author I adore, I can find some things to like even if I don't love everything. But this was just not the book for me, I guess? Le sigh, let us break it down! •Young Edgar is, you know, a regular dude. I liked that he wasn't completely broody and maudlin. He was just a guy w You can find the full review and all the fancy and/or randomness that accompanies it at It Starts at Midnight . •Young Edgar is, you know, a regular dude. I liked that he wasn't completely broody and maudlin. He was just a guy who loved to write, had fallen in love, and wanted to make something of himself on his own terms. I mean, sure he was intense and such, but that isn't a bad thing! It was a good choice to write him in a likable and relatable way. •The time period/historical stuff was so fun to learn about! Since I didn't go to college in Virginia in the 1800s, this was a fun new adventure! I loved the look into the lives that Edgar and his contemporaries lived. Also, the author has a ton of information at the end of the book about Edgar, his family, and his friends that we meet in the book. This was probably my favorite part. •Nothing... happened? Like Eddy had a beer today, cool, cool. He hugged his mom, splendid. I just kept waiting for the plot and it wasn't there. It never came. Like okay he "met" Leonore, his muse. Whatever even that is, I have no idea because it wasn't ever fully explained. Fought with his dad. Wrote some stuff. And then this whole thing repeated a few times: Muse encounter, writing, fight with Dad, lather rinse repeat as needed. •Lenore was a bore. See what I did there? It's nice that I amuse myself, no? Anyyyyway, I had to because Lenore certainly wasn't amusing me. Like, she was pretty pissed, and I get it because hello, Edgar wasn't exactly treating her nicely. But would I treat a hallucination/bird-person nicely? NO. In part because you all know how I feel about bird people, but also I wouldn't want to be hallucinating so um of course he wanted her to vanish? Like sweetie, use some common sense. You're whatever a muse is, and that is probably scary. •Like I mentioned, I never completely understood the muse concept. Is this something that was popular in the nineteenth century? Or was it just a thing for the sake of the story? I am fine with whichever, but try as I might I couldn't find anything specific on this "muse" business, because there are a lot of things/products named Muse. And when I searched "Poe Muse" it just kept trying to link me to a Poe Museum which is decidedly not what I wanted and this is turning into more of a story about Google than a review so I'll stop. My point is, why did everyone and their mom (literally) see this... thing? Woman? Bird? Look I don't even know, okay. Why am I only now reading Cat Winters? Where have I been the last five years? Under a rock maybe? I’m not sure, but I'm incredibly pleased to have discovered her with The Raven’s Tale. I can’t remember the last time the quality of a novel’s prose stopped me dead in my tracks, but the poetically macabre tones of this story were brilliantly drawn. I’ve no idea if this is a hallmark of Winters’ work, but this book alone lands her a spot on my short list of most talented writers. It was simply that good. Historically speaking, the novel pairs nicely with both Cothburn O’Neal’s The Very Young Mrs. Poe and Lynn Cullen’s Mrs. Poe. Like these titles, the novel follows the course of one of Poe’s relationships, but The Raven’s Tale is a much different tale in that it blends Poe biographical history with the development of the hauntingly dark qualities of his imagination. Having said all this, I have to admit falling head over heels for Lenore. I’m a history buff and assumed I’d favor the facts, but Winters’ unsettling muse grew on me and by the end of the novel thoroughly upstaged the rest of the cast. Lenore is a deliciously chilling apparition, but I came to adore the allegorical nature of her role both in the novel and in the larger world of publishing. I was all in on a Cat Winters book about Edgar Allan Poe. I absolutely loved this idea and it’s breaking my heart to rate this so low. Edgar was fairly captivating. He was passionate and creative and friendly. Lenore was creepy and it was interesting getting her POV. Their relationship felt toxic, even though it seemed imperative to Edgar’s writing. Plot wise is where I really struggled. The story dragged and even though I was intrigued, I could have easily set the book down and never finished i I was all in on a Cat Winters book about Edgar Allan Poe. I absolutely loved this idea and it’s breaking my heart to rate this so low. Plot wise is where I really struggled. The story dragged and even though I was intrigued, I could have easily set the book down and never finished it. I will say that the writing is reminiscent of Edgar’s writing and I love that Cat was able to imitate that. Overall, it was an amazing idea and the research behind it really shows the effort. Sadly, it just wasn’t for me. And I could take down every single one of them with a few strokes if my pen, for I see the ugliness inside us all." Cat Winters doing a book inspired by Edgar Allan Poe's muse/life? I'm all here for that! I really enjoyed this one but it's ODD, no like really ODD. Honestly, I have no idea where to even begin with this book - it's a strange one, but I'll do my best. The Raven's Tale in a very unique, haunting and beautiful ta And I could take down every single one of them with a few strokes if my pen, for I see the ugliness inside us all." Honestly, I have no idea where to even begin with this book - it's a strange one, but I'll do my best. The Raven's Tale in a very unique, haunting and beautiful tale. It centers around our main protagonist, the famous author Edgar Allan Poe and his muse, Lenore. We start off by learning that Edgar was adopted after losing his parents to a fire. His adoptive parents are well off and he has had the best of everything but is still seen as a bit of an outcast because his biological parents were into the arts and that is completely frowned upon. Edgar's adoptive mother is caring, but fairly weak and now sickly - she doesn't really stand up for Edgar but she does love him and tries to support him in her own quiet way. His adoptive father, on the other hand; is a complete bully of a man. He obviously cares very little for Edgar and lets him know it at every chance he can get. He's ashamed at Edgar's love of poetry and wants him to go into the family business. He's abusive, neglectful and just an all around horrible human being. I couldn't find one redeeming quality in this man. Edgar is finally going to University and is very eager so he can get away from his controlling father, hopefully for good. Edgar is in love with a young woman and she seems to feel the same way about him, but her parents are not at all happy about the match, so they have to have their romance in secret until he comes back a better match for her when he's through University. Of course, nothing goes as planned. Edgar can't give up his love of poetry - it's his life force, it's what makes him who he is and lately his poetry has gotten more and more dark. In this world, if your passion/vision is strong enough than your muse can enter this world and become part of it, eventually morphing to it's full potential when fully realized. Edgar's muse is Lenore. Yes, Lenore from the very famous poem, The Raven. I'm a huge fan of Edgar's work and I'm so happy it focused on Lenore because I don't think there is anything more iconic than her in his works. The muse, Lenore is a dark and morbid character. She feeds off creativity and needs it to live. However, Edgar is horrified that she has come to life and completely ashamed and denies her the creativity that she so desperately needs by denying himself. We see both Lenore and Edgar fall into a desperate dark depression. One that can truly only be undone by Edgar giving into his passion - his writing. This story is very dark and deals with themes of abuse, depression, and poverty. It's a very polarizing read - it would be very easy to be confused by this one since it's such a odd concept. It's told in two POV's - Edgar's and his muse, Lenore. Lenore chapters tend to be more lyrical and dark, which I doubt will be for everyone but I loved it. The writing is stunning. Cat Winters has a wonderful talent of being able to blend historical fiction with elements of the supernatural so seamlessly. This is my third book I've read by this author and I just love her writing style. I need to first mention this cover. It's gorgeous and fits the book so well. Edgar Poe lives with the Allan family. His parents are dead and they took him in. John Allan is not nice to Edgar. Edgar writes poems and the arts are basically a sin. The bishop preaches that the town was punished by fire and death because of the theater there. Those people followed their muses and muses are evil. They even built the church over the bones and destruction from the theater fire. Edgar is in love I need to first mention this cover. It's gorgeous and fits the book so well. Edgar Poe lives with the Allan family. His parents are dead and they took him in. John Allan is not nice to Edgar. Edgar writes poems and the arts are basically a sin. The bishop preaches that the town was punished by fire and death because of the theater there. Those people followed their muses and muses are evil. They even built the church over the bones and destruction from the theater fire. Edgar is in love with Elmira and wants to marry her. But he is going off to school and they promise to write each other. Lenore is Edgar's muse. She finally appears to him and others. Most are terrified when they see her, but Edgar is torn. She helps him write of death and dark topics that aren't allowed. Lenore wants Edgar to pledge himself to her, but he hasn't yet. She follows him to school where he meets another muse, Garland. Garland helps Edgar with satire to entertain the other boys at school. Edgar is doing well at school, but he is also struggling. John never paid all his fees and Edgar finds himself in great debt. He starts gambling. Some of the boys are intrigued by Lenore and want to see her. But Garland wants Lenore gone. Throughout the book, we really see Edgar's internal struggles. Should he do what John wants? Should he find a way to finish school? Should he follow Garland or Lenore? Should he keep writing and telling tales? The book alternates between Edgar and Lenore's perspectives. We see Lenore living in the shadows, hiding, but also wanting to be seen. We see her transforming. She gets feathers and will be a raven when Edgar pledges to her. She wants everyone to listen to Edgar (and her) and tries everything she can to keep him close. I really enjoyed this book and gave it 4 stars. Thank you to Amulet Books for sending me a physical copy for review. Warnings for slavery, abuse, and death. 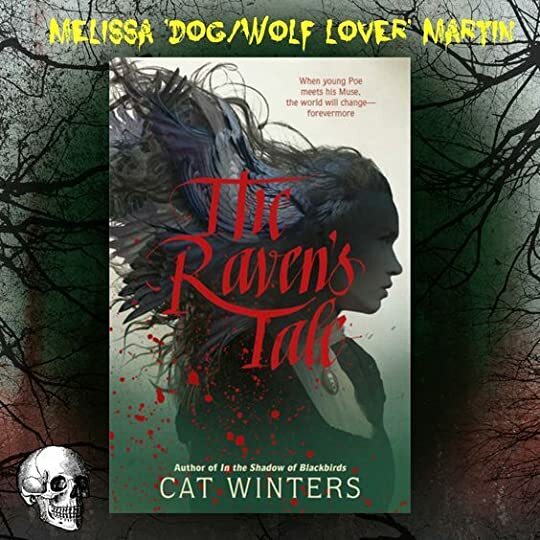 The Raven's Tale by Cat Winters is this author's newest historical fantasy novel. As she's one of my favorite authors (this is the fifth book I've read from her), I can't believe I lucked out and got approved by NetGalley for this novel featuring Edgar Allan Poe, one of my favorite classic writers, and his muse. Unfortunately, it's my least favorite of everything I've already read from her. That being said, I'm still giving it thr I received an ARC from NetGalley in exchange for an honest review. The Raven's Tale by Cat Winters is this author's newest historical fantasy novel. As she's one of my favorite authors (this is the fifth book I've read from her), I can't believe I lucked out and got approved by NetGalley for this novel featuring Edgar Allan Poe, one of my favorite classic writers, and his muse. Unfortunately, it's my least favorite of everything I've already read from her. That being said, I'm still giving it three stars so there's still quite a bit that I liked even if it didn't live up to my expectations. As always, Winters' writing is lush and richly detailed. She has clearly done her research to create 1820s Richmond and Charlottesville, Virginia as well as bring Edgar's early years to life. I also particularly enjoyed getting to know our young and creatively passionate Edgar Allan Poe. He's trying to come to terms with himself, his work, and his foster father's expectations for his future. Winters does a pretty fantastic job of recreating his Poe's style, by the way. The weakest points for me though were the concept of the muses and the plot itself. I felt too out of the loop when it came to how the muses work, especially when I realized some other characters have them as well. That said, I still enjoyed reading Lenore's perspective chapters. As for the plot, not a whole lot happens over the course of 368 pages - I suppose I was hoping for a little more action. Overall, though, The Raven's Tale is still definitely worth reading if you're a fan of Cat Winters' wonderful style, Edgar Allan Poe, and historical fantasy. IT'S CAT WINTERS AND I CARE ABOUT MYSELF. So much work went into creating this novel that it makes you wonder if Winters borrowed a raven haired muse herself. “The Raven’s Tale” follows a young Edgar Allan Poe as he struggles with his writing and the pressures of his father when his muse comes to life and wants nothing more than to feast upon his writing and to be seen by the world only she is not a creature of beauty but rather the darkness and melancholy of his soul and she will not rest until her poet recognizes his worth. I am a hug So much work went into creating this novel that it makes you wonder if Winters borrowed a raven haired muse herself. I am a huge fan of anything regarding the infamous writer since there’s so much about his life that remains a mystery given the conflicting accounts after his death and the subject matter of some of his more famous works set him apart from your average writer and Cat Winters tapped into that mindset so perfectly I had to double check to see which lines belonged to each writer. This story is the personification of adolescence and the constraints of society when your family wants you to go in one direction but your heart or in some cases your very soul pushes you into another and that became very real as Lenora refused to lurk in the shadows and pulled on the hand of Poe encouraging him to continue to write and explore his passions regardless of what others may think. The blending of fantasy and reality through actual quotes, critiques and reviews blend this story together into something that gives us a glimpse into the past while subtly granting us whispers of what the future held for Poe and I loved every second. Maybe it's because I've never read anything from Poe, but I did not understand what this book was going for. Despite my love of Cat Winters, this story did not strike me as particularly well crafted overall. The Raven's Tale blends historical fiction with gothic fantastical elements as it retells the life of a young Edgar Allen Poe. It takes a very interesting approach that is poetic and atmospheric. Ultimately I do think it works, although it took me a little while to get a feel for what the author was doing. Largely based on real historical events, this rendition weaves in Poe's muse, personified as a macabre young woman named Lenore (name taken from iconic poem The Raven). This is a dark story, f The Raven's Tale blends historical fiction with gothic fantastical elements as it retells the life of a young Edgar Allen Poe. It takes a very interesting approach that is poetic and atmospheric. Ultimately I do think it works, although it took me a little while to get a feel for what the author was doing. Largely based on real historical events, this rendition weaves in Poe's muse, personified as a macabre young woman named Lenore (name taken from iconic poem The Raven). This is a dark story, following the difficulties of Poes young life with the mythology surrounding Lenore woven into the story in interesting ways. I would particularly recommend this for fans or admirers of Poe's writing who are interested in knowing more about his life and some of the influences on his work. The orphaned son of an actress, he was fostered by a wealthy family, but has a very dysfunctional relationship with his foster father. It is an emotionally abusive relationship that is quite central to the plot of the story. His father tries to squash Poe's dreams of writing in favor of more pedestrian work. In terms of content, be aware that there is definite emotional abuse, along with images of death and violence. Also, there are depictions of slavery in the book which are historically accurate, but might be a little uncomfortable. I think it's handled reasonably well, but it does get tricky. There is a slave woman who is thought to have been a major influence in the development of Poe's macabre imagination, and in the text, we see the major disparity between the two in terms of ability to utilize that creativity professionally. In some ways, it is tragic that his inspiration may have been a woman of color, and yet what we remember is the work of this white man. An interesting enough concept but one I unfortunately just couldn't get into. First off, I cannot get over how intriguing the concept of the muses appearing both in personified form, but also their whole history in general is. There were so many fascinating elements to The Raven's Tale such as the prejudice the characters have against the theater and the horror/mystery genre as a whole. The Raven's Tale is a story about Poe struggling to come to terms with the gothic elements in his work, but also of him struggling to come to terms with who he is. Throughout the book there are all these characters who expect him to be other than he is. And he has to continuously struggle with their expectations, and who he wants to be. Thank you to the publisher for providing me with a review copy via Edelweiss! As a huge Edgar Allan Poe fan, I expected to enjoy this historical retelling about the author's early poetic endeavours, but after 20% of a snail's-pace plot, vague supernatural elements and repetitive descriptions of nervousness, I'm too exhausted to attempt to finish Winters' novel. While I applaud the author for her close imitation of Poe's literary structures and expressions, her claustrophobic crowding of the narra Thank you to the publisher for providing me with a review copy via Edelweiss! As a huge Edgar Allan Poe fan, I expected to enjoy this historical retelling about the author's early poetic endeavours, but after 20% of a snail's-pace plot, vague supernatural elements and repetitive descriptions of nervousness, I'm too exhausted to attempt to finish Winters' novel. While I applaud the author for her close imitation of Poe's literary structures and expressions, her claustrophobic crowding of the narrative with objects and adjectives and her original concept of Muses as demonic, ravenous creatures kept alive by an author's output, she fails to capture the raw emotion of Poe's lyric and prose, resulting in a stilted narrative tedious to experience. Even Poe's wonderful language is rendered artificial and melodramatic in its overuse. This was an intriguing and beautifully written story about the young Edgar Allan Poe and his ghostly muse Lenore who tries to inspire and encourage him to write his poetry even though it is against the wishes of his strict foster father. Edgar and Lenore were amazing characters, I loved the development of the bond between them and some of their scenes together were heart breaking especially in the final chapters. The writing is lush and lyrical and very addictive and I raced through this anxiousl This was an intriguing and beautifully written story about the young Edgar Allan Poe and his ghostly muse Lenore who tries to inspire and encourage him to write his poetry even though it is against the wishes of his strict foster father. Edgar and Lenore were amazing characters, I loved the development of the bond between them and some of their scenes together were heart breaking especially in the final chapters. The writing is lush and lyrical and very addictive and I raced through this anxiously to find out what happened in the end. I will definitely read more books by Cat Winters in the future and I also want to read more about Edgar Allan Poe and his early life. This is a beautiful and unusual book which I would highly recommend. The Raven’s Tale is evocative of gothic beauty. Winters paints a picture of madness and creates vivid symbols of imagination and genius. It is a tale woven with darkness and prose that will send shivers down your spine. This book fed my gothic soul and the Poe lover in me. It was everything I hoped it would be, and so much more! My mind was alight with images so clearly described by the beautiful writing found within, and my heart consistently beat like the Tell Tale Heart. I truly felt like I was The Raven’s Tale is evocative of gothic beauty. Winters paints a picture of madness and creates vivid symbols of imagination and genius. It is a tale woven with darkness and prose that will send shivers down your spine. I truly felt like I was in the mind of young Edgar Allan Poe. And putting a face and symbol to his muse was a stroke of genius. Lenore was macabre and beautiful. I loved envisioning what could have been going through his mind during this time, and what inspired him to write his famous works. I also really loved that I could tell that Winters did her homework on both Poe and the time period. But, what I truly loved was the message that I got from the story. It wasn’t just about Edgar Poe’s early life and creative inspiration. It was about doing what you truly love and not letting others bring you down. It was about not being ashamed of who you are, even if others don’t understand. The Raven’s Tale was deep, dark, and dangerous. It screamed Edgar Allan Poe. It was gothic perfection and it gave all the same feels as if I were watching a Vincent Price movie. It bordered gloriously on the side of horror while offering the intrigue and excitement of the paranormal. Thank you to Abrams Kids/ Amulet Books/Pique Beyond for providing me with this finished copy in exchange for my honest review, and as a #RavensTaleAmbassador. This was such a cool, lovely read with so many fun, recognizable details for Poe nerds. I loved the way Winters depicted his battling muses, and his works in progress, and the way his poetry developed, and the way the final poem plays on The Raven is just brilliant. It's clearly extremely well researched, and I enjoyed it so much. I'm embarrassed to admit this was my first Winters read but I'm excited to get to her others! 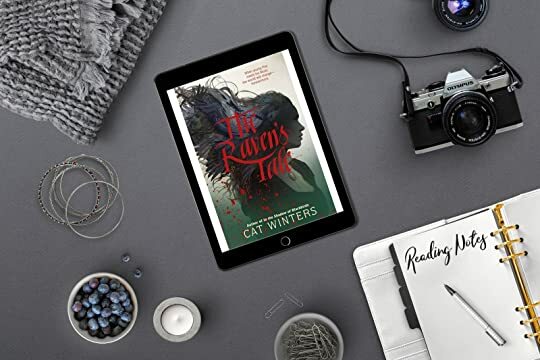 Thank you to Netgalley, Cat Winters and Abrams Kids for my arc of The Raven's Tale. This book really intrigued me, a retelling of the life of Edgar Allen Poe, how could I resist? The Raven is my favourite ever poem! Edgar Allen Poe is desperate for the moment he can escape to university and out from under the thumb of his overbearing foster father John Allen. Once at university he can finally make his way in the world of writing and get enough money together to marry his sweetheart Elmira. But w Thank you to Netgalley, Cat Winters and Abrams Kids for my arc of The Raven's Tale. But when his dark, gothic muse appears things start to go badly for Edgar. I really liked this novel. I'm ashamed as a literature student to say that I knew next to nothing about Poe's life so it was really interesting to learn about it in the context of such a wonderfully dark and enthralling story. Cat Winters is an award-winning, critically acclaimed author of fiction that blends history with the supernatural. Her young adult works include IN THE SHADOW OF BLACKBIRDS, THE CURE FOR DREAMING, THE STEEP AND THORNY WAY, ODD & TRUE, and a forthcoming novel about Edgar Allan Poe's teen years, THE RAVEN'S TALE (available April 16, 2019). She is also the author of two adult novels, THE UNINVITE Cat Winters is an award-winning, critically acclaimed author of fiction that blends history with the supernatural. Her young adult works include IN THE SHADOW OF BLACKBIRDS, THE CURE FOR DREAMING, THE STEEP AND THORNY WAY, ODD & TRUE, and a forthcoming novel about Edgar Allan Poe's teen years, THE RAVEN'S TALE (available April 16, 2019). She is also the author of two adult novels, THE UNINVITED and YESTERNIGHT. She has been named a Morris Award finalist, a Bram Stoker Award nominee, and an Oregon Spirit Book Award winner, and her books have appeared on numerous state and "best of" lists.